ABC Surveys, was recently awarded the contract for survey works on Al Sufouh Tram Line project in the Emirate of Dubai. The project was awarded by Belgium-based construction company Six Construct. 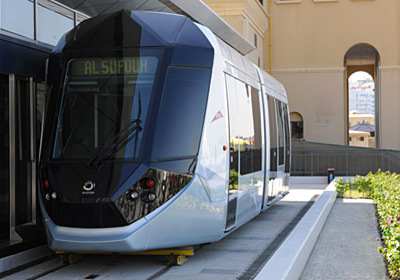 Being built in Al Sufouh, Dubai, the 14.7 kilometres long Al Sufouh Tramway project had been stalled for the past three years. Dubai has raised USD 675 million (AED 2.47 billion) to restart the project and the first phase is expected to be complete in the first half of 2014. Abu Dhabi National Exhibition Centre is the largest exhibition venue in the Middle East. ABC SURVEYS project covered all required survey activities refer to development and construction of state-of-the- art Capital Gate Building and Capital Centre. Capital Centre is a mixed-use business and residential micro-city being masterplanned by ADNEC and constructed around the Abu Dhabi National Exhibition Centre. Upon its completion, Capital Centre will comprise twenty-three towers, including six branded hotels, four commercial buildings, eight residential and serviced apartment complexes, and 5 mixed-use developments. It will be back-dropped by waterfront views and will become a fully integrated exhibition-lifestyle destination. Capital Gate, part of the Capital Centre complex, is a 160 metre, 35-storey tower being built next to the Abu Dhabi National Exhibition Centre which incorporates a slanting-core concept to feature an 18-degree westward lean. It will include 20,000 m2 (220,000 sq ft) of office space and house Abu Dhabi’s first Hyatt hotel. The tower will link directly to the exhibition venue as well as a 2.4 km Marina Zone currently under development. Survey of the specific locations of the existing road (single carriageway) including the median painted edge line and edge of the asphalt on the shoulder side. Topographical ground level survey of 100 Hectare on an approximate 10 m grid basis for Al Wathba plot area, including the measurement of additional breaklines and formlines to produce a digital terrain model (DTM) to simulate as accurately as possible the land terrain form and Establish and coordinate of three (3) permanent Benchmarks, in vicinity of plot area. ABC Surveys undertake the LiDAR survey of the 132KV OH Transmission Lines Fujairah- Tawyeen and Fujairah- Dibba to provide Inabensa and TRANSCO with a highly accurate and detailed terrain model for proposed design of Tower location. . ABC Surveys are using the latest camera and LiDAR technology to acquire data as rapidly and cost effectively as possible. The TopEye system contains two sensors, a LiDAR sensor as well as a medium format aerial camera. The TopEye technology is used for demanding solutions requiring high resolution LiDAR and digital imagery. The TopEye system addresses the need to quickly obtain accurate survey data along a corridor. The system uses a helicopter-mounted laser to scan the line. It records the three-dimensional coordinates of millions of points on and around the line while also taking aerial photography. ABC Surveys use specially developed software to classify these points into ground points as well as structure points and wire points where existing lines cross the proposed route. PLS-CADD is the ideal tool for converting LiDAR data into an engineering model of a line. Ground levels are to be captured by LIDAR on an approximate 4pts/1m2 grid basis with additional breaklines and formlines measured where required to ensure all significant changes in elevation are recorded to create a 1m digital terrain model (DTM) to simulate as closely as possible the land terrain form. ABC Surveys had been part of ALDAR BESIX Project Management Team and on daily basis supervised survey works on Yas Island Project including Retail Shopping Mall, Car Parks and infrastructure projects. We had been successfully engaged with various numbers of teams for period of two (2) years. ABC Surveys has been partner of Vision ME and supplied Ground Control on Jeddah and adjacent Mountain Regions Aerial Photography and LiDAR Survey. Ground Control covers more then 6400 square kilometres. Duration of Site survey and production of Survey Report was six months.